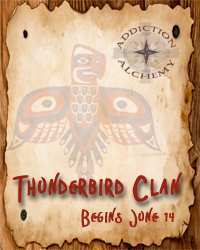 Appearing across the board, in almost all native lore, Thunderbird is rich and complex, drawing in a variety of other elements which compliment his power. Thunder, Lightning, Woodpecker, Trickster and Sacred Clowns are some of the energies intertwined with the gift of the Thunderbird. Seemingly disparate, as you will soon see these energies all work together to help us go from one end of the spectrum to the other. It takes a great deal of power to go, for example, from the vortex of an addiction and push the slider over into passion and devotion to your cause or purpose, to completely change the shape of your body or your mind for that matter. But that is what we are calling Thunderbird in to do! This is the polarizing pull of Thunderbird, bringing complete redemption through sudden, sometimes shocking bursts of Light or Truth as we break with denial. Yet, if we call on the consort of Thunderbird, the Trickster or Sacred Clown, we can learn to stand back and laugh at our foibles. Even amidst grief and pain, we have the power to put things in perspective and not take our mistakes too seriously. Especially when we learn that when we were "screwing up", we were being someone else's Sacred Clown...showing them something about themselves that they could not see. Just as those who trip us up have done for us. Thunderbird can help us see ourselves in the Coyote/Trickster hall of mirrors. Knowing that we are both the reflection and the mirror can help us take it just a little bit easier on ourselves. The swift electrical flashes of lightning and the commanding sound of thunder can jolt us out of denial and oblivion very effectively and certainly get our attention. If you are already in addiction recovery then you might remember the day you realized you had a real problem, the day you broke with denial. Those are Thunderbird moments. Some of us experience this with a DUI, loss of loved ones, loss of a job, incarceration or nervous breakdowns. But don't forget that lightning and thunder can also herald new ideas, invention and creation! Thunderbird is a powerful ally as you ground out some idea, inspiration or belief and anchor it into the physical. Think lightning bolts coming from his eyes and then the larger than life sound of thunder punctuating them like exclamation points and you get the picture. So perhaps you are further along than you realize and there is something you will be creating, inventing or developing. Did you know that most of the time lightning strikes from the ground up? The medicine wheel helps you understand where you are in your process and to come to terms with the paradox of taking those things as signs that something in your body/soul wants attention or needs to change, without giving yourself a life sentence with no hope of redemption. Thunderbird helps you navigate judgment and mercy and teaches you how to ALLOW them to meet in the middle. When you start accepting and stop judging yourself so harshly, conversely this frees your energy for other things... such as moving forward in life and creating something new and wonderful! I have come for you as I have heard your call for complete and radical transformation. You are calling for a reversal of something in your life. You want to change or create something new NOW! I hear this loud and clear. You have learned your lessons and you have come a very, very long way in your human evolution, possibly much more than you know. Yet, there are blockages and obstacles that are on your path. You know they are here for your greater good? Say yes! The Trickster and the Sacred Clowns are all around you, like a drill sergeant they tease and taunt you into doing better than you have ever imagined. They push you beyond WHAT YOU THINK are your limits. They help you understand that you can create ANYTHING you want and furthermore they goad you into finding your genius. That part of you that creates from your soul. And best of all YOU HAVE "HIRED" THEM to help you do this. "Send in the clowns" has been your anthem and you have called these tricksters into your life to help you evolve. And therein lies the irony of it all. Yet, the great equalizer is that just as quickly can you send them away. When you "get" the lesson, when they are no longer giving life to the distorted beliefs in your heart and a voice to that doubting, judgmental nag in your head, you might be surprised at how quickly things change. Thunderbird says don't get mad, take a lesson. If someone in your life, either past or present, appears selfish, self centered, uncaring or self absorbed maybe they are only there to teach you what it looks like to take care of your own needs and to nurture yourself. Why not become a little selfish yourself? And then again maybe you are being selfish and you don't know it!! Maybe you're the one who is self absorbed...maybe, just maybe you need to be right now! Did you ever think of that? So maybe you need to give others the same leeway! See how the snake eats it's tale? The deeper our denial, the more insane the clowns become. Leave no paradox unturned. Examine all options. Drop the victim and stop thinking you are in the know. Obviously you want the wool removed from your eyes or you wouldn't have called upon Thunderbird. For Trickster, ushered in by the power of Thunderbird will ensure that you get the message. You can giggle about your mistakes and let a little mystery back into your life or you can grieve for the rest of your days, that is your choice. Ever wonder why the Dali Lama is so full of mirth? Maybe one answer is because everything matters...and nothing matters.....we're all special...and no one is special! It's a hoot! So then you begin to see that the only thing that seems to matter is what you bring through the portal of your soul into this physical world. You better make it good! Thunderbird says knowledge is great, but you better be able to forget what you know as quickly as a thunderclap, for when you do everything that you need will be magnetized to you. The clowns will make sure that you have the awareness and the eyes to see so you can receive everything that is before you. One of my greatest gifts is my ability to heal you with a flash of Light (break with denial) and then the sound of thunder, allowing you to be reborn into a new way of being. Why do you think I am called a Thunderbird? This is a clue for you, my friend, a call to action that your soul in conjuring. You must use the power of sound to heal and raise your own vibration. Woodpecker, my earth-winged brother reminds you to drum, to never forget the power of drumming and how it helps you connect to your own heartbeat, the memory of the heartbeat of your own mother and mother earth. It will reset your magnetic energy, bring in light, help you clear past memories and connect to your heart, among other things. It will even shine your shoes! Ha ha ha! He he he!!! But seriously, ever noticed how hard it can be (without training) to sing in harmony with others? The natural instinct is to go to the same tone that someone else is singing. But you want to break out of the pack, now don't you? This is what this is all about, right <wink>? Now, I hear you saying you are ready and willing to vibrate in harmony with others. Let's see if that is true. This first requires you to find a very clear tone to harmonize with, one that can hold it's own. Thunderbird helps you do this with the power of sound. Sound and energy healing needs to become an integral part of your life, along with absolute silence and stillness. Also, this may be part of your calling to help others honor the thunder beings. Think about it! Then do it! Boom, boom! That's my ultimate gift to you, says Thunderbird - a lightning bolt - an idea - a flash of inspiration, followed by the song of the thunder beings - that mighty vibration of sound moving you to take action... galvanizing you into movement...faster than the speed of light. I am grateful for this life experience. I forgive, but I do not need to forget, because I acknowledge the value of all that I experience. I allow my beliefs to be transformed and transcended. I step outside of time and into the realm of eternity to empower my life. I understand that the Universe is conspiring on my behalf to manifest my desires. I purify my desires and intend for my highest good. I attract from the purest essence of my desire. I use the power of sound to heal myself and others. I honor the lessons that this life brings me. Inside of me is something truly unique which is constantly seeking expression. I communicate with all the parts of my being. I am a multi-dimensional being. I belong to the world and the world belongs to me. I remain fluid and flow with my life. I am open to learning new things. I release the need to control and flow with discernment. I allow myself to receive all things needful, both spiritual and material. I freely give to others that which I wish to receive in my life. I play the sacred drum and hear its echo in my heart. I came into physical form to express my whole self. I am body, mind, heart, soul and spirit. I am a conscious and masterful co-creator of my life. I am the one I have been waiting for. I have an important gift and message for the world.